Part One examines the work of Julia Harenčár, under Principal Investigator (PI) Doctor Sarah Swope, on the effects of pollen with Calochortus tiburonensis. 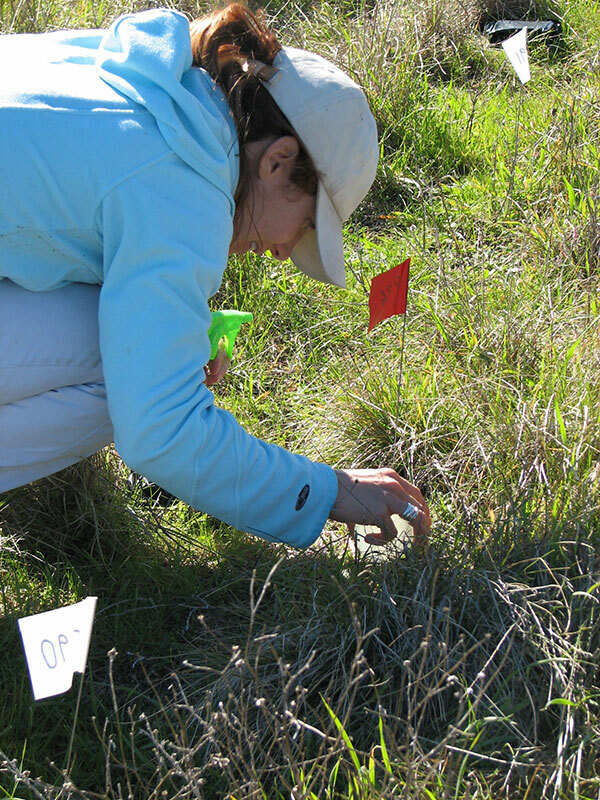 Swope, a visiting professor in the biology department at Mills, is conducting a 10-year study on the demographics of federally endangered C. tiburonensis, also known as Cati, a flower that can be found only on one hill in Marin. So far, little is known about the flower’s biology, ecology or status, but Swope is working on changing that. Through the Jill Barrett Program, Swope works with select students to explore the flower, allowing students to gain field experience while also participating in ground-breaking research with an expert in her field. “In the broadest sense, we are trying to describe the pollination ecology of this rare plant and how this may influence its long-term prospects for survival via the amount of seed plants make, and whether plants in the small population are losing genetic diversity (bad for long-term persistence) or adapting to local conditions (good for long term persistence),” Swope said in an email. Swope is an avid endorser of the Barrett program and has supervised four Barrett Fellows so far. Students presented research completed over the summer in the field and lab alongside their PIs at the 2013 Inaugural Barrett Biology Research Symposium. Julia Harenčár, a student who worked with Swope in her Cati research through the Barrett program, said the experience she gained through the program was invaluable. Julia Harenčár is a junior majoring in biology with an ecology theory and practice track, and has focused her research on the effect of pollen quality and quantity on seed sets in Cati. Over the summer Harenčár narrowed her research down to three questions: Is Cati reproduction in a small, low density, isolated population limited by the amount of pollen? Does the source of the pollen matter? And is there local adaptation versus inbreeding? The quality of pollen can have an effect on the number of seed produced by a plant, as can the amount of pollen that a plant receives from its pollinators. Rare plants such as Cati often make less seed than they are capable of, often times because the small patches of plants are inconspicuous to pollinators so they simply don’t get enough pollinator visitation to turn more ovules into seeds. The two reasons why the source of the pollen could matter: either the small population is suffering from inbreeding, or there is local adaption occurring within the stressful conditions where this small population is found. The pollen-quality aspect of her research showed that it is likely that the small, isolated population of Cati is undergoing a local adaption. There is the possibility that plants from different populations diverge from one another genetically; this can happen when plants in smaller population lose genetic diversity, in which case pollination by plants from a larger population is beneficial to the plants in the smaller population, increasing their diversity. Alternatively, the populations could be diverging from one another genetically because they are adapting to different local stressors. These two possible outcomes have very different implications for the conservation of this plant. Harenčár conducted an experiment to see if these phenomena were occurring in Cati. She conducted hand pollination, testing whether seed sets in plants in the small, isolated population was limited by the amount of pollen plants received from pollinators, and to begin to explore the possibility that either plants in this small population are losing genetic diversity (to their detriment) or they are adapting to the local conditions in ways that allow them to tolerate the more stressful conditions in this particular site. She concluded from her experiment that the quality of pollen does matter because the number of seed sets varies depending on the source of the pollen. She also found that small populations could be producing more seeds if the individual plants were receiving non-pollinator visits. She will continue her research with reciprocal transplant experiments where seed as opposed to pollen will be moved. The data Harenčár is collecting is crucial for understanding what promotes (or limits) reproduction in this rare and protected plant. Her research will also help make predictions about how this plant is likely to respond to a rapidly changing climate and what might be done to help protect it. What’s next: Harenčár and Swope will be conducting a field experiment to answer the question: “Are the different populations adapting to different local conditions?” They also hope to begin some genetics work to determine if there are differences in genetic diversity between the large and small populations. Bigger picture: The research being done over the next 10 years will form the basis of the recovery plan to be used by the U.S. fish and wildlife service for this very rare plant. Why is Dr. Sarah Swope interested in plant pollination levels? Abiotically stressful sites (the negative impact of non-living factors on the living organisms in a specific environment), like the one in Marin, are very interesting places to study plants, according to Swope, because they tend to leave a particularly strong imprint on the evolution of populations. In addition to these abiotic or environmental forces, interactions with other species — both enemies such as herbivores and seed predators, and mutualists such as pollinators – influence plant populations and their prospects for persistence. For example, it is too early to say with certainty at this point, but one possible outcome of our research is that plants in this small, peripheral population are actually adapting to the unusually stressful conditions and this bodes well for their long-term prospects in the face of climate change. But, reproduction (seed set) may be suppressed by a lack of pollinator visits to such a degree that even though the population is adapting, it may still be declining towards extinction simply because the plants are not making enough seed. Swope enjoys the challenge of trying to account for both abiotic and biotic complexities, how both vary across the landscape and through time to influence plant population dynamics. She wants to make concrete, meaningful contributions to the protection of the rare species that define California’s unique flora.